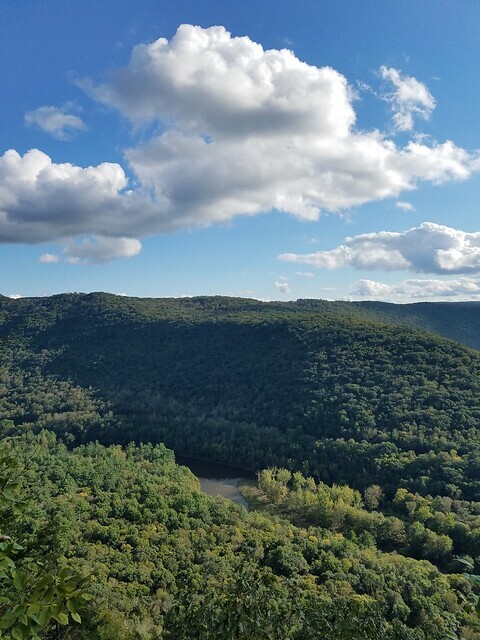 The Quehanna Wild Area is one of my favorite places, with its diverse scenery and habitats, isolation, wild elk, and numerous hiking trails. I recently spent a weekend camping in the wild area with Michael, Rick, Jodi, and her family. 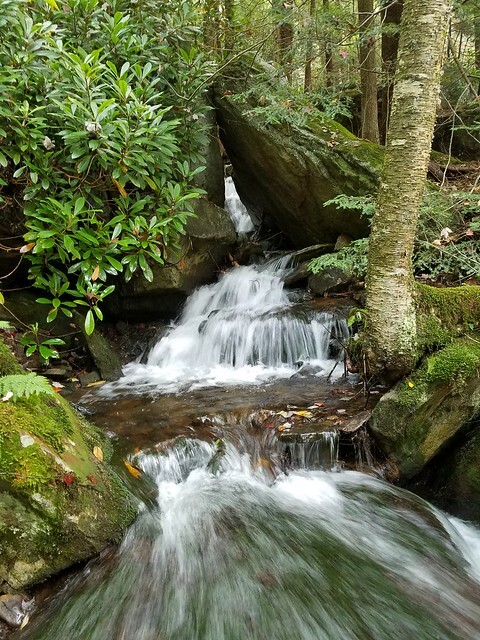 We base-camped along the Red Run Trail in a beautiful pine grove next to a cool spring. The wild area is not known for its vistas or waterfalls, but I suspected they were there, waiting to be discovered. So, we decided to find out. Our first hike was to explore the gorge of Little Fork Draft. 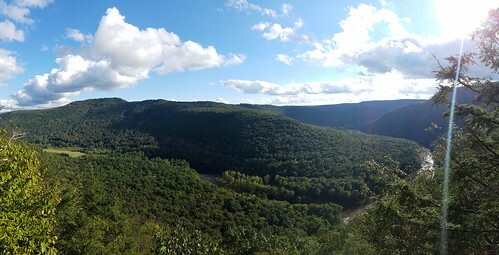 This hike was completely off trail and is located in the Elk State Forest. This gorge is located in the northern end of the wild area. We parked along Red Run Road where it crosses Little Fork Draft. While it may be tempting to hike up an old grade or forest road on the east side of the creek, it is best to head west on the road a little ways until you reach a grade blocked by rocks on the left. This grade climbs gradually and then enters an old meadow with apple trees, indicating it was once a homestead. Here, the grade faded away. We could see the tops of the mountains from the meadow. From here, we hiked up along Little Fork Draft. We passed a small tributary on the left, which marked our return route. The draft was very beautiful with cascades and deep pools framed by mossy boulders. Tall trees rose above us, including many sizeable tulip poplar trees. We then crossed the creek below some large cascades over more giant boulders. The scenery was superb. Here, we took a break. We made our way up the gorge, wading through nettle which was mostly withered from the end of summer. At the head of the gorge, where the two forks of Little Fork Draft meet, we took the left or east fork. Here, the terrain became steeper. The creek bounced down large boulders. We soon entered a stunning glen of giant boulders creating an assortment of cascades and waterfalls. The tallest was about twenty feet. 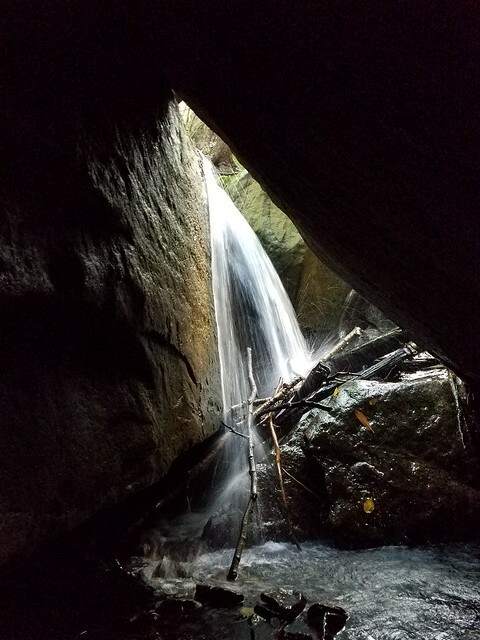 We even saw Cave Falls, a 12 foot falls the tumbles into a cave formed by boulders. Incredible. We climbed our way up the glen, each of us impressed by the beauty. Cascading water surrounded us as the creek took a variety of routes between the giant boulders. 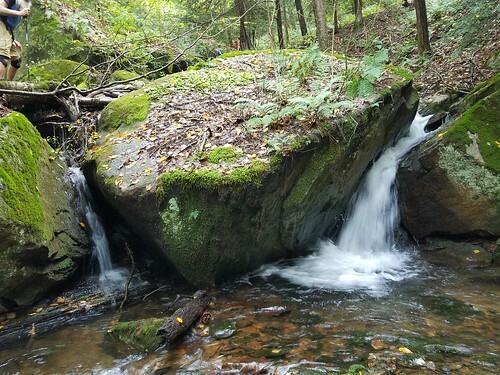 House sized boulders loomed deep in the woods, often clothed in moss and ferns. Above the glen of waterfalls was a grove of old growth trees with large maples, birches, and hemlocks. Our climb up the creek continued. The gradient eased and smaller cascades adorned the creek. We reached more large boulders and cascades and climbed out of the gorge to the top of the plateau. We headed north along the rim of the plateau. 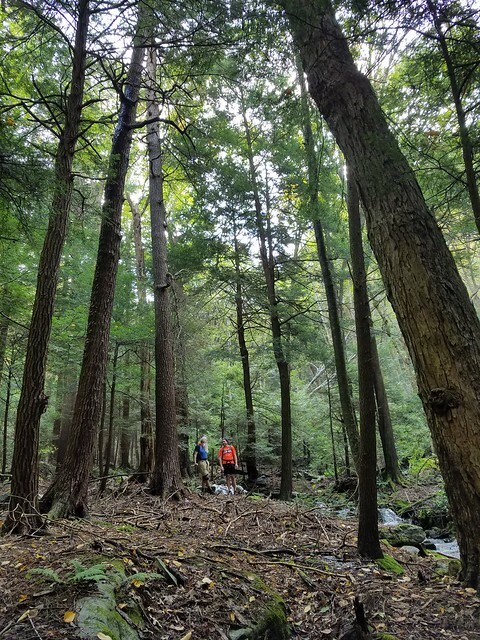 There was a marked difference between the wet hemlock and moss forest along the creek and the drier laurel and oak forest on the plateau. We made our way through the mountain laurel, which was moderately thick. We tried to follow game and deer paths. As we proceeded north, the laurel became less thick. Our descent was marked by a nearby pipeline swath. We descended the ridge, passing large boulders including three that were stacked on each other. We descended the ridge, reaching a superb view up Little Fork Draft and its 1,000 foot deep gorge. Tiers of ridges descended into the gorge. The descent continued and was a bit steep. We reached a second view, and the most impressive. It was a 180 degree view looking up Mix Run and a vast panorama of plateaus, gorges, and glens. Each of us were impressed. Quehanna is such a beautiful place. Our off trail descent continued, and at times it was very steep. We switchbacked down to the tributary mentioned earlier, crossed Little Fork Draft, reached the meadow, and retraced our steps. Little Fork Draft is a place of stunning, wild beauty. 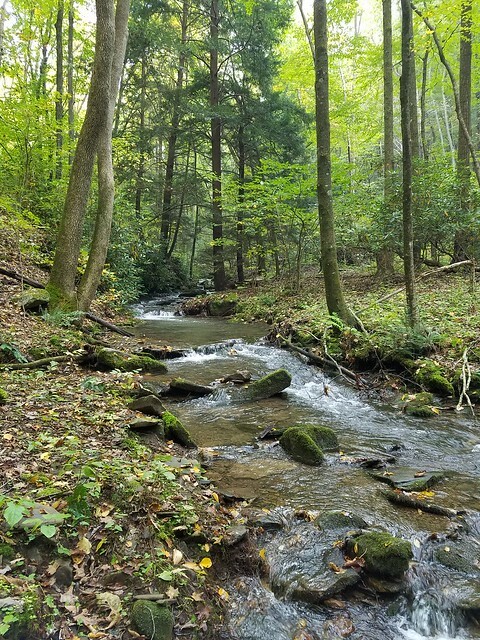 It illustrates the hidden wonders that lie within the vast Quehanna Wild Area. This is one the best hikes I’ve done, and will surely return. Difficulty: Very difficult. There are stream crossings and very steep terrain. Stinging nettle will be an issue in summer. This is an off trail hike with no blazes or signs. Highlights: Excellent vistas, old growth trees, large boulders, cascades, waterfalls, isolation. Parking: pull off parking at about 41.313528, -78.213757. Sand Bottom Vista in SGL 134. 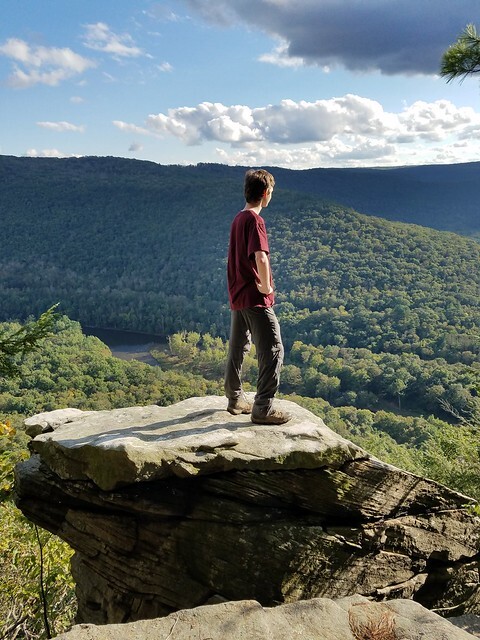 Looking into the Loyalsock State Forest. 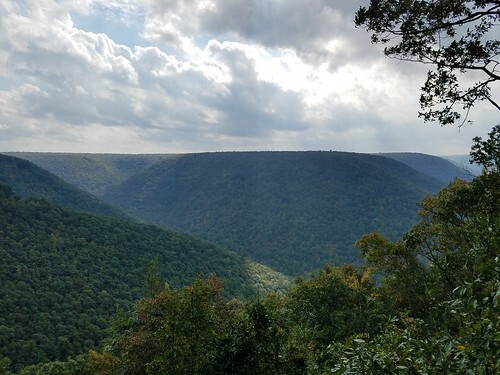 Pennsylvania has many vistas from isolated cliffs and meadows. However, for some reason, trails rarely seem to go to them. 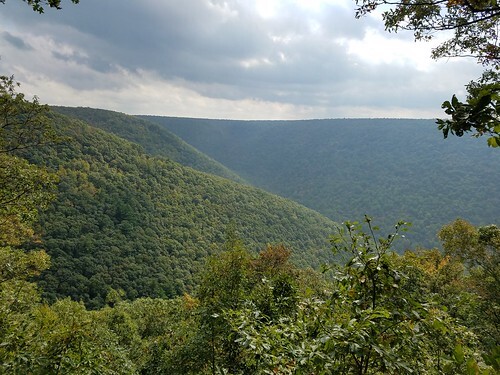 One such vista is in SGL 134 as it looks over Sandy Bottom in the Loyalsock State Forest. We call it the Sandy Bottom Vista. I drove up the game commission road from Hoppestown Road and parked at the lot. Ben was there and we continued down the gated road to the left and entered the woods. This is an off trail hike. The hemlocks forests were beautiful and made the hike fairly easy. We continued along the contour of the plateau above an unnamed stream, heading south. We descended to some large ledges and soon reached the view. 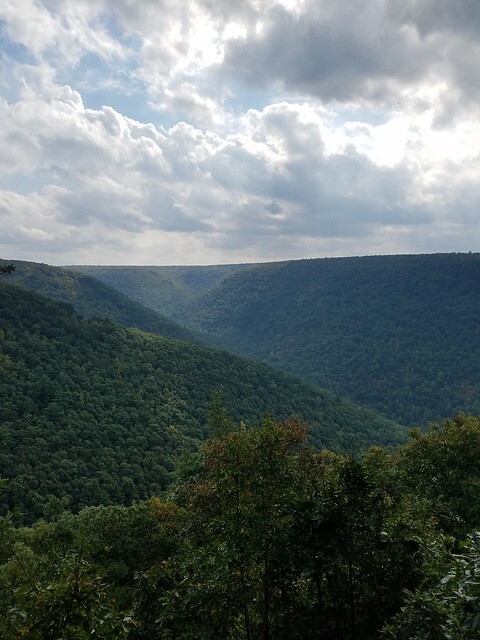 The view was truly breathtaking, rising 700 feet above the Loyalsock Creek. The vista is at the top of a towering cliff and offers a near 180 degree view. We could see the bend of the creek below and the tiers of ridges and plateaus. Hawks soared below us. Nearby is a unique pedestal rock with its own superb view. You do have to jump a couple feet to get to the rock. If you are afraid of heights, do not go onto it. The setting behind the view was beautiful with cliffs and ledges. Hemlocks grew over carpets of moss. It felt like an island in the sky. There was one more view along the escarpment of cliffs. From the view we descended to the unnamed creek to the east. I would not recommend doing this as it is steep. The creek is beautiful with an assortment of cascades and an old grade on the west side does provide access. 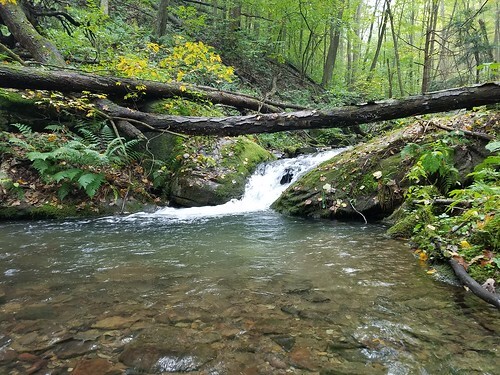 The east branch of this creek does feature many large cascades and a 15 foot falls. There are also some large trees. The east branch has the old grade, unique old stone retaining walls, and a spring cascade that pours out the ground. If you want to explore the creek, I suggest taking the grade down from the top. Keep in mind the grade fades out before meeting the road to Huckle Run. The hike to the vista is about .75 miles, one way. It is off trail. The best approach is to the follow the rim of the plateau above the unnamed creek to the east, descend gradually, and curve right below some ledges to the vistas. Park at 41.420963, -76.751659. Vista is at 41.409875, -76.749178. Red is the off trail route to the vista. Green is the old grade above the unnamed creek. SGL 36 is located south of Monroeton and features a surprising array of natural beauty. 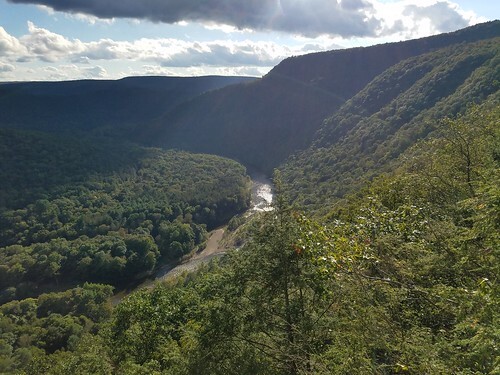 There are cliffs, excellent views, waterfalls, gorges, and rock mazes. 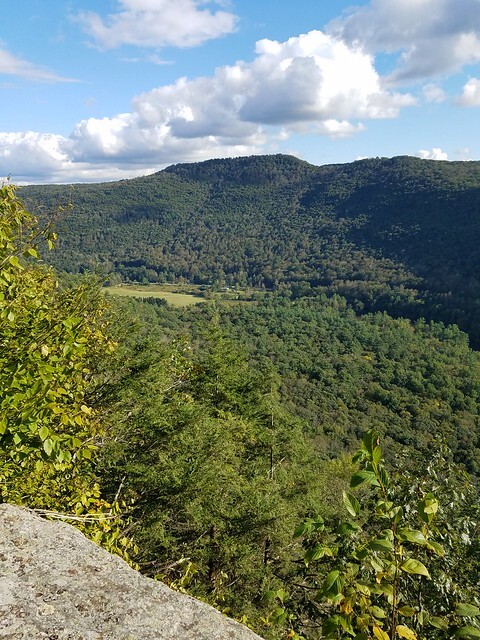 Off of Deep Hollow Road, there is an unblazed, unsigned trail that goes up to a unique rock maze called Split Rock with a view and impressive chasms and mazes. We parked at a pull off along Deep Hollow Road located at the game lands boundary and sign. The trail begins across the road. Next to the trail is a small creek. First, we hiked up along the creek. There really isn’t a trail, so follow the creek as best you can. We came to some small cascades, a 12 foot falls, and then a glen with an impressive 40 foot falls, Deep Hollow Falls. Cliffs and ledges towered around us. The falls is an impressive sight, but it does often dry up in summer. 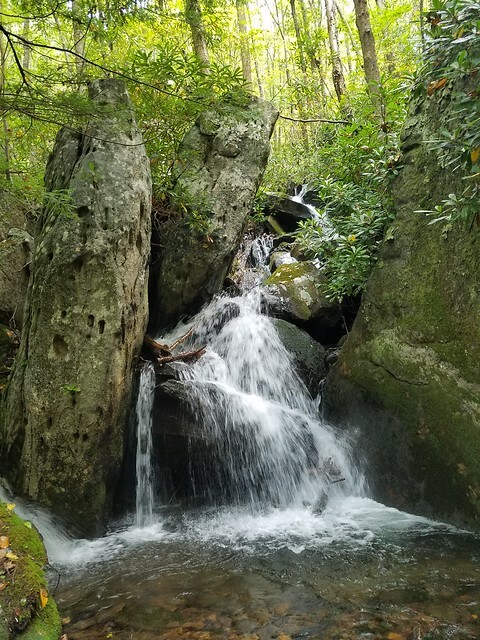 There are more waterfalls above Deep Hollow Falls, but they are not nearly as tall. We made our way back to the trail and climbed up to the plateau through thick laurel and some wet areas. The creek announced its presence below us. The trail curved left and continued its gradual climb. We then reached a T intersection, where we turned left. The trail was a little less established, but still easy to follow as it crossed the top of the plateau with oaks and rock outcrops. 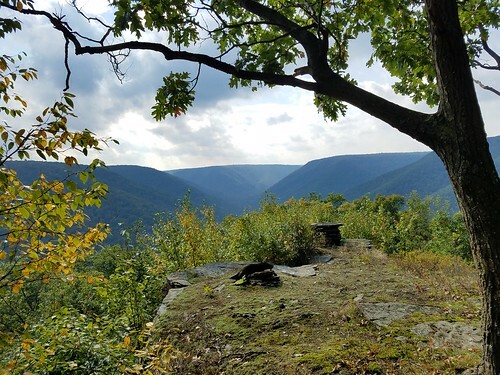 At some cairns and rocks arranged to read “Love You”, the trail went left to the edge of the plateau to a fine view over Deep Hollow and the plateaus. Below were cliffs and deep chasms. To see the chasms, we hiked off trail, heading west along the top of the rocks. We made sure to avoid the deep cracks and chasms in the white bedrock. We reached an area where the rocks had separated further in a variety of tilted, upright rectangles. Here, we descended to the bottom to explore the various chasms, mazes, and passageways. The scenery was unique and beautiful. Split Rock is comprised of white conglomerate. I explored the base of the rocks with its overhangs and small caves. There were tight passes and veils of moss. We made our way to the top and bushwhacked back to the trail and returned to the car. 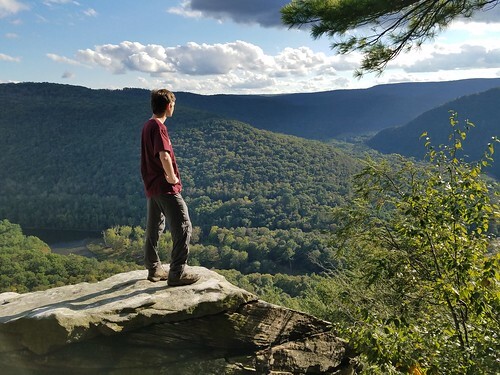 This is a great hike of moderate difficulty and is about 3 miles, round trip. Be very careful exploring the rocks and deep chasms. The conglomerate gets slick when it is wet. The parking pull off is located at approximately 41.647178, -76.520248. Thanks to Ben Van Riper for his assistance with this map.